If you’ve never had an It’s-It, go get one now. No seriously. Stop reading this, go to the store, and get one. Don’t worry. I’ll wait …. 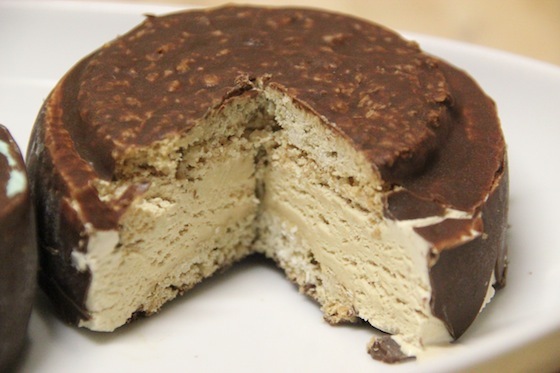 Alright, alright, for those of you with the above issues, an It’s-It is an unbelievably delicious, sinfully rich, jumbo ice cream sandwich made with dense, quality ice cream, two firm, but chewy oatmeal cookies, and the whole thing is dipped in a crispy dark chocolate shell. It’s-Its were created at San Francisco’s very own Playland at the Beach, and were sold there exclusively until Playland closed in 1972. They used to be hand-dipped, but since Playland’s closing their popularity has done nothing but grow, and today, they’re made in a factory in Burlingame, just 20 minutes south of SF. 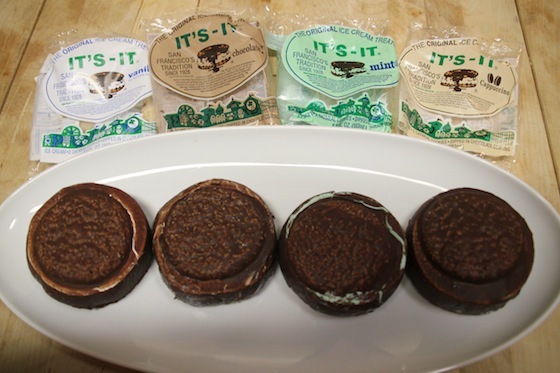 While the It’s-It has added a few more flavor variations (they now come in Vanilla, Chocolate, Mint, and Cappuccino), they’re just as wonderful as ever. The original flavor was vanilla of course, but as a kid I was always partial to the mint ones. 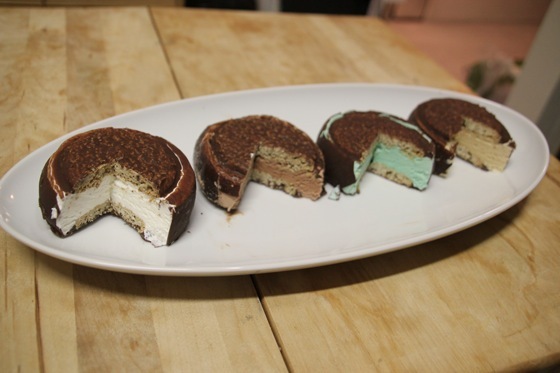 I was born before the time of Ben & Jerry’s and “premium” (read: wacky flavor) ice cream, so Mint was a novelty (as was Cookies & Cream ice cream when it first came out), and the chocolate (I believe) and cappuccino flavors were added later. While watching the Playland at the Beach documentary (and going to Playland Not-At-The-Beach last year), I got nostalgic for my old friend the It’s-It and wanted one … and then I realized, I’d never actually tried all the different It’s-Its flavors! What an awesome excuse to get my It’s-It fix. Vanilla – while I normally love vanilla ice cream (you can turn it into anything! ), this vanilla is somewhat nondescript, which initially a bit of a bummer for me, but the really, really nice thing about the original vanilla It’s-It is how it showcases the lovely cinnamon flavor of the oatmeal cookie. Very nice. Chocolate – I’m not a chocoholic, but I do like chocolate when I have it, and this chocolate ice cream does not disappoint. Rich, full, chocolatey flavor. Mint – My favorite from childhood. 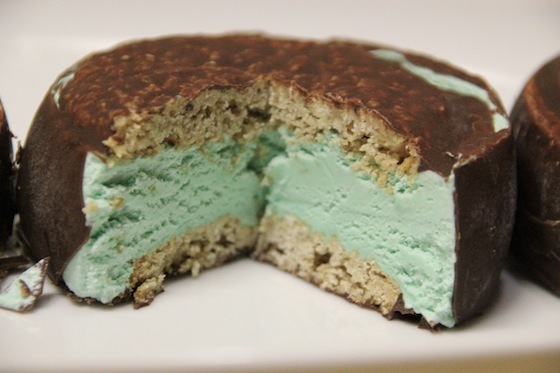 There’s still just something about this beautiful green ice cream. Like I said, I grew up before Ben & Jerry’s so mint chocolate was a big deal, and it continues to be in this fantabulous It’s-It. Cappuccino – This is like the “grown up” It’s-It. Delicious. I think they used a great coffee ice cream. 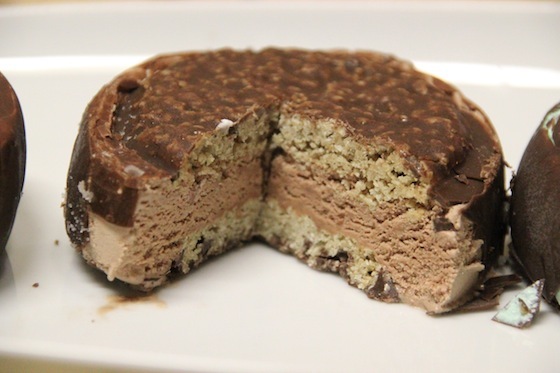 Paired with the chocolate shell and oatmeal cookie, you really can’t lose with this one. The secret of It’s-Its is that they’re made with good quality ingredients. 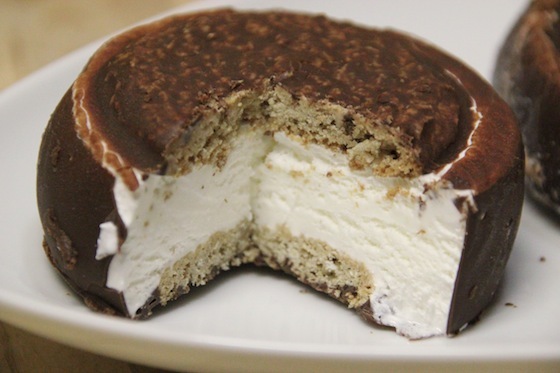 They don’t use ice cream that has had tons of air whipped into it, so it melts super quickly, or cookies that have no substance so they fall apart. None of the ice creams are overly sweet in my opinion (of course they’re sweet, they’re ice cream! But not sickeningly so), and though the combination of all the elements together is pretty sweet, that’s why you have to savor the whole thing slowly – just not too slowly. It will melt eventually … if you can manage not to inhale the whole thing in one swoop. Though I am still partial to my Mint It’s-Its, after tasting them all, I really love each for their own characteristics. It’s-its are the best dessert ever, created in the best city in the world. I love SF!